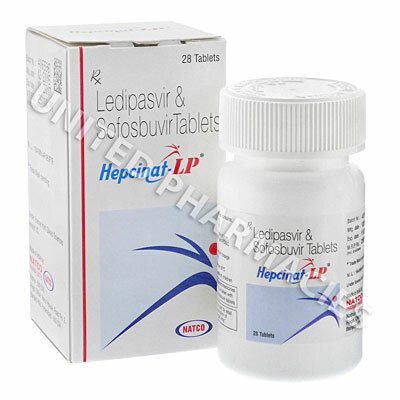 Hepcinat (Sofosbuvir) and Hepcinat-LP (Ledipasvir/Sofosbuvir) are the breakthrough treatments for Hepatitis C infections. Its mechanism of action involves inhibiting the enzyme which is necessary for the virus if it is to multiply. 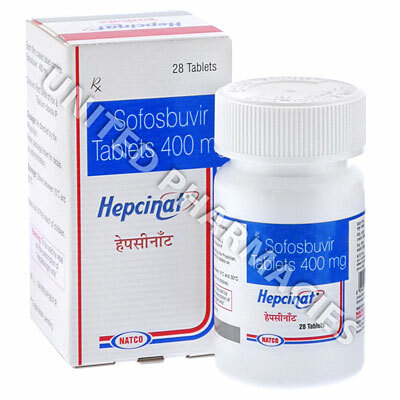 Hepcinat (Sofosbuvir) and Hepcinat-LP (Ledipasvir/Sofosbuvir) are the breakthrough treatments for Hepatitis C infections. Its mechanism of action involves inhibiting the enzyme which is necessary for the virus if it is to multiply. A complete cure may even be possible. Chronic hepatitis C is a serious infection of the liver which occurs following an infection with the hepatitis C virus. Upon reaching the cells of the liver, the virus begins to multiply, which it achieves by means of copying its DNA and RNA. This medicine is known as a nucleotide polymerase inhibitor, and it works directly on the virus itself. After oral administration, it undergoes a process of intracellular metabolism in which it is converted to its active form. It subsequently starts to work, whereupon it actively targets the enzyme that is used by the virus to produce RNA chains (HCV NS5B RNA-dependent RNA polymerase). This can help to stop viral multiplication. Treatment of genotypes 1, 2, 3 and 4 is possible with this medicine, however it is always used in combination with other medications and never on its own. Hepcinat (Sofosbuvir) or Hepcinat-LP (Ledipasvir/Sofosbuvir) film coated tablets each contain 400mg of the main ingredient. The dosage schedule must be individualized by the physician in charge of treatment, and will vary according to the viral genotype that is being treated. Adult patients will usually be directed by their physician to take 1 tablet per day, and it can be administered alongside a meal or else without food. Those suffering from GT1 or GT4 (genotype 1 or 4) may be ordered by the physician to take it alongside ribavirin and peginterferon alfa, with treatment lasting for a period of 12 weeks. In contrast to this, GT2 (genotype 2) is usually treated for 12 weeks, and it is taken alongside ribavirin. GT3 (genotype 3) requires 24 weeks of treatment in combination with ribavirin. Patients must only take it according to the instructions provided to them by the physician in charge of treatment. It will be necessary to go to the emergency room straight away or to immediately see a physician if you suffer from behavior which is significantly different to before, feeling severely weakened, a pale appearance, swollen gums, sores occurring in the mouth or any other serious adverse events which have not been referenced here. Patients who are undergoing treatment for Hepatitis C with Hepcinat (Sofosbuvir) or Hepcinat-LP (Ledipasvir/Sofosbuvir) will require regular visits to their physician or the hospital so that routine blood tests can be carried out. The frequency at which these tests are required will be determined by your physician. There is a risk of birth defects or other serious harm to an unborn baby associated with this medicine, and it should never be taken by pregnant women. A minimum of 2 effective non-hormonal barrier methods of contraception should be used at all times during treatment and for at least 6 months following the completion of treatment. It is very important that patients are aware of the fact that there is a risk of infecting others with hepatitis C, and taking this medicine will not prevent this. Male patients should also not take this medicine if their partner is pregnant, as harm could be caused to an unborn baby if a child is fathered by a man who is taking this medicine.